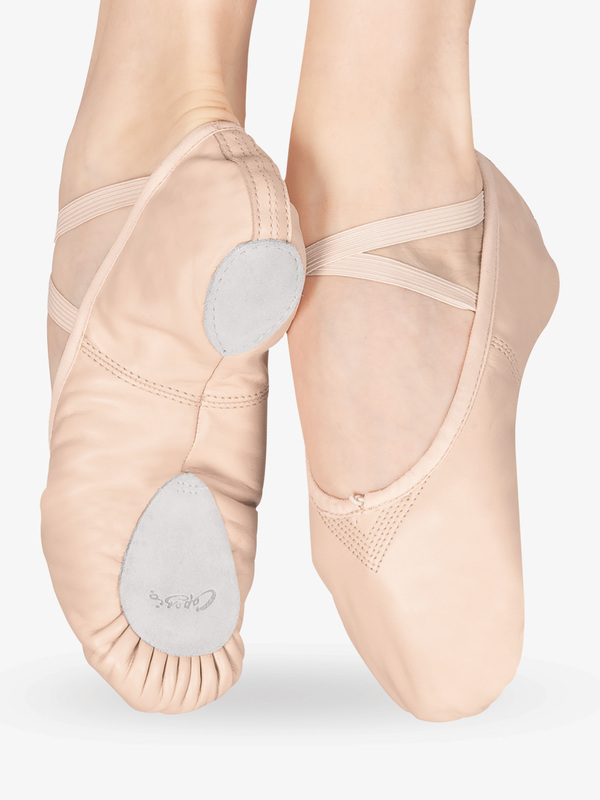 Capezio's "Cobra" leather split-sole ballet shes has a soft poly/cotton lining for comfort. The suede forefoot is sculpted and engineered to enhance performance. Other features include hidden forepart stitching, flat pleats, and padded suede heel patch for comfort. Pre-attached elastic at the heel. My 7 year old has worn Theatricals basic ballet shoes with the ties and one strap for 3 years now. I figured it was time to get a better shoe. These Capezio's look beautiful, the leather is very pretty and soft, but they are SUPER NARROW. My daughter had them on for about 5 seconds and said they were way too tight. She normally wears a size 11 in street shoes, the 11 in the Cobras were so tight it was laughable. The elastic banding had no give and squeezed her foot horribly. Maybe the wide and a full size larger would work. Returning. The sizing chart on the listing says "Street Shoe Size". My child wears a 13.5 in street shoes. I bought a 13.5. They seem to be about 2 sizes too big. this is a good product for the price. fit is true to size. elastic for tightness is good. My daughter has worn this style for 2 years now and refuses to go back to the "classic" style of ballet shoe. She says her feet are more comfortable in the Cobra. The 2 elastics wrapping around her ankle keep her feet secure and the heels never slip off. Also, the elastics never pinch her ankle because of their ideal crossover position in the shoe. The leather is easy to clean. The color is "pale pink" which is exactly right. Some folks have said it is "tan". It is not. BUT if you are expecting a bright pink, it is not that. The pale pink color works perfectly with the costumes in the annual Nutcracker and spring recitals. Today, I am ordering this shoe for my daughter as she has grown out of her smaller ones that she's worn for 2 years. Sticking with the Cobra again. Her old shoes are still in great shape and will be passed down to my younger daughter - who is very excited to get them! These run HUGE! My daughter is a size two in Bloch ballet shoes and a 2 in capezio jazz shoes. These look as if they are an entire size too big! Worse- expect to pay to ship them back, should you need to return them. Buyer beware. I have bought these shoes as my child has grown and she has loved them. Fit well and last. Love the color. I ordered pink and the color is more like light tan. My daughter has been dancing for 5 years and these are the worst fitting ballet slippers that we've ever got. Awful fit, hurt her feet.